We are experts in body work and major repairs. At Carvan Motors Inc., we know how important your vehicle is to you. Our staff will do everything they can to fix your vehicle right the first time and with the least amount of inconvenience to you. We service foreign and domestic cars of all makes and models. 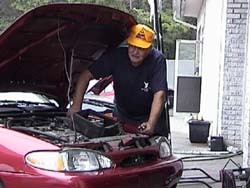 We do simple things like oil changes and tire rotation to the highly technical work such as computers and fuel injection systems. Click here to get our special coupons . When it comes to tires we are the professionals. Our technicians will fully inspect your tires to make the right recommendations concerning repair or replacement. We offer a full line of tires and tire services. The braking system of your vehicle is a complex system of electronic, mechanical and hydraulic components. All parts must work all of the time for safe stopping. Regular and complete inspections are important to finding problems before they become serious and/or expensive to repair.